Are you operating in the cement, construction or building industries. 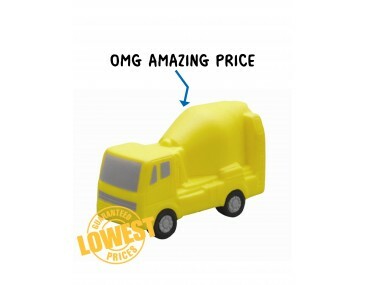 These little trucks will add a fun twist to your next advertising drive. They offer a quirky and unusual way to get your brand noticed. Our stress toys are high-quality gimmicks that your clients will love to keep close on their office desks, in their cars and in their laptop bags. When things start to get too much and stress builds up, they will grab the little trucks and start squeezing and squashing them to get rid of the pent up tension. The trucks also make great office desk ornaments when they are not being bashed around. Our stress toys are manufactured from a strong and durable material and will last for years, no matter how much strain they take. This cement truck is a mini replica of the real thing. The front cabin has large windscreen and smaller side windows. The back features the turning cylinder that defines any cement truck and is instantly recognisable. It comes in a bright sunny colour. Your logo will be in full view for them to see. Let us brand your personalised company logo and graphics onto these stylish trucks and offer them to clients as freebies. Our listed price includes branding of your logo or graphic in a single colour print onto the truck. Please note that our prices exclude GST and a print set up of $75 applies. We offer a product turnaround time of two weeks, but we can offer even faster turnaround times for urgent orders. This product is supplied in bulk quantities and is available for delivery within Australia only.